Another look back at the historic space being occupied in time and theme by Occupy Olympia, given the commentary by Ken Balsley and the news this morning. Some 80 years ago, Capitol Lake was the home to a similar type of resident. Shanties and shacks lined the shores of lower Budd Inlet, as the area now known as Capitol Lake was called. These hovels were known by the collective name of “Little Hollywood”. For years those living in the area were allowed to exist, but eventually, authorities moved in moved out the residents and burned down the shacks. 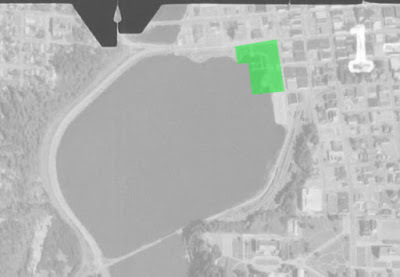 It was felt, unless the outbreak of war interfered, the long discussed Capitol Lake would soon become a reality and the city father decided, as a preliminary step, to eliminate Little Hollywood from the shores of the Deschutes waterway along the Northern Pacific railyard. The capture of two kidnapper-rapists of the town's last sensational crime in one of Little Hollywood's shacks had given the place a bad name and it was undeniably a civic eyesore. The residents were, in fact, mostly decent poor and elderly people trying to hold onto the last of their independence. Most had bough their shoreside shacks and floathouses from previous owners from $10 to $50. There were about 50 WPA families, 30 old age pensioners and a few direct welfare recipients. some of the more able bodied supported themselves with odd jobs and scavenging. One resident was said to be a formerly prosperous farmer who had lost everything except $50 in the depression. He had spent his remaining fortune on the floathouse he occupied. The city had been offered federal funds to provide low-cost housing, but Mayor Trullinger didn't believe in federal handouts. Besides, low rent housing might bring an undesirable class to town... the kind who had the bad tase and judgement to be aged, handicapped, poor or some color other than pure white. The people of Little Hollywood were served eviction notices and the civic authorities turned a deaf ear to their please for someplace to go. One after another, the shack-town and its occupant surrendered and went away... some to rundown rooming houses, and fleabag hotels, some to other towns. A few of the old age pensioners moved to a modernized version of the old fashioned poor farm which was appearing on the Northwest scene. First euphemistically called "havens for old folks," they later became "nursing homes." The proprietors of some of them, then as now, adopted the adage of the poor farm supervisors... "The less you feed 'em the better the profit." One after another the shacks and floathouses were burned or demolished and a civic eyesore vanished and was forgotten... just like the people who had been driven from it. It was listed as one of the proudest accomplishments of Mayor Trullinger's administration. ...city officials who barely had tolerated Little Hollywood during the worst depression years decided in 1938 that the shacks had to go. The sizable job of carrying out that order was given to W.R. Turner, building inspector. Turner enlisted the aid of Beale Messinger, city police lieutenant at the time, and the two set to work. First, the ownership of each of the shanties was determined. This was no small job in itself. Then, each of the owners was served with condemnation papers. As Little Hollywood's residents were evicted, their shacks were burned. Two years after Turner and Lieutenant Messinger started their chore, the torch was applied to the last shanty. As Turner recalls, "Some of Little Hollywood's residents were pretty nice people, but most of them were bums." The condemnation proceedings were carried out with a minimum of fuss and fury, the building inspector remembers. "There was one guy who let me inside his shack and then took a swing at me with a two-by-four," said Turner, "but that only happened once." Couple of more points to make, this time with some old aerial photos from USGS's Earth Explorer. One, while everyone points out that Little Hollywood was ironically located below the capitol campus, even if the shacktown didn't exist, the land below the dome would've still been unsightly to some. In fact, Little Hollywood likely owed its existence to the location of railyard that Newell refers to. 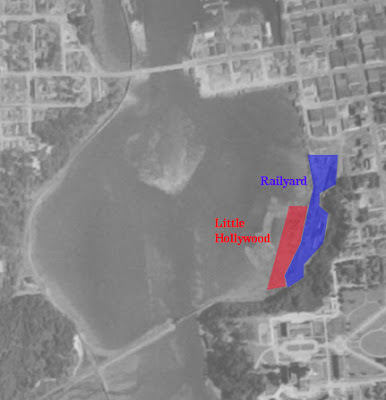 In this aerial from 1941, you can see fairly well how the railyard lays in between the settlement and Olympia proper. So, while Little Hollywood itself might have been seen as a civic eyesore, it was the industrial use of the Deschutes waterway and poverty in general that put it where it was. Is it any wonder that the real modern version of Little Hollywood has been moved permanently to an industrial park? Even as late at 1957, we see Capitol Lake, lakeside industrial buildings and a fully functional rail yard. 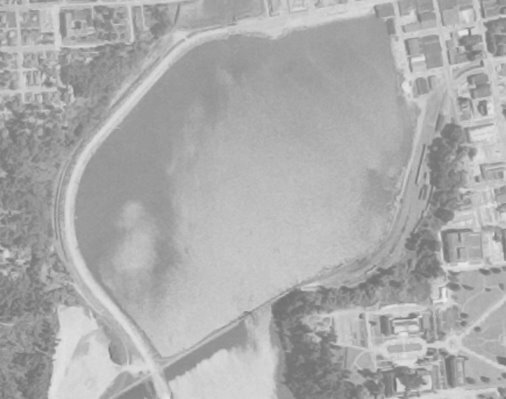 It wasn't until 1964 that any sort of park was built on Capitol Lake, and when it was, it only occupied a small corner.